Jennifer Mills has started a new Facebook group that I know many of you will want to contribute to. If you're like me, I watch the news and think, "I want to go down there and do something!" Well, here's something we can ALL do! Friends, I wanted to let you know that I have created another Facebook group that I think will be a possible resource like the Hurricane Harvey Book Club. The group I have created is called Hurricane Harvey Games and Activities Club. Thank you Kathryn Butler Mills for helping inspire this idea, as well as all those out there volunteering to help so many that need it. My biggest goal for this group is to have activities people can do with limited resources and to help them stay positive. Please join the Hurricane Harvey Games and Activities Club and share your personal favorites. 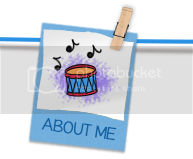 Everyone can share in words, with pictures, videos, etc. Please pass on this link so we can all do what teachers do best – HOLD HANDS AND HELP EACH OTHER! This was always a good story to share at the beginning of the school year to remind children that we are all different - and we are all special! Directions: Put the apple and knife in the bag and have it in your lap as you begin to tell the story below. Insert children’s names in your classroom to capture their interest. 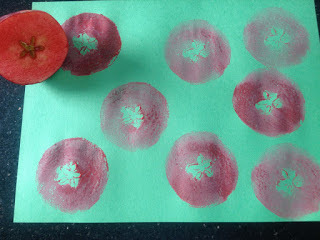 Follow up by having apples for snack or doing apple prints. *Tell this story many times using different children’s names each time you tell it. Here's another finger play where children will develop math concepts, small motor skills, and oral language as you entertain them. A song and a "happie" for hurricane Harvey victims! Please pass this message on to anyone you know who needs a song right now. 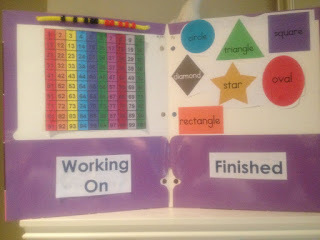 I used this activity for a math workshop a few weeks ago and many of the teachers wanted the words and pattern. 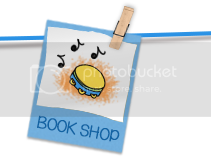 Children will count, match one-to-one, subtract, learn combinations for five, and learn about money as they sing and have fun. Down at the candy shop what did I see? Five little gummy bears smiling at me. He/she bought the green one and took it away. Four little gummy bears smiling at me. Along came (child's name) with a penny one day. He/she bought the red one and took it away. 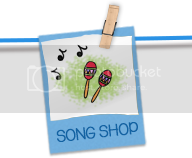 Continue singing as children buy the other colors. 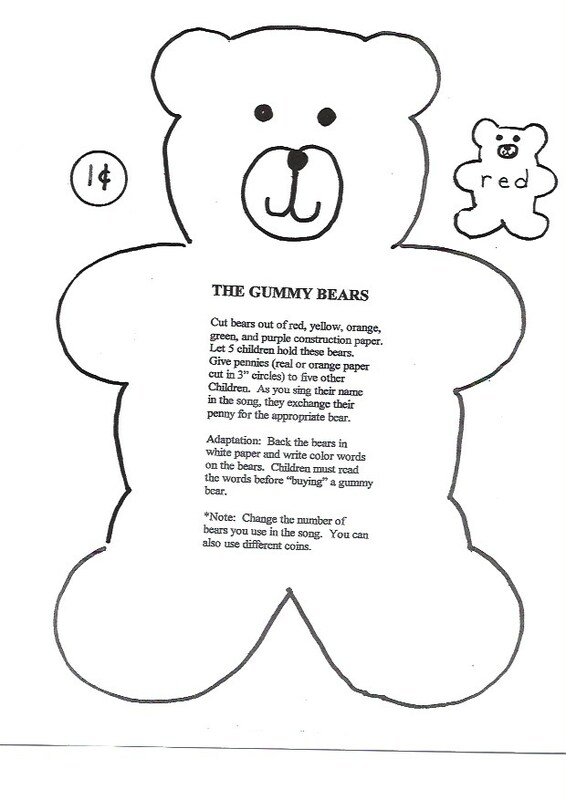 Adaptations: Change the number of bears in the song. Use nickels, dimes, or quarters. Pumpkins, valentines, and other seasonal items can be used in place of the bears. How you start the school year will impact your classroom management the rest of the year. Here are some tips to focus your children's attention before starting an activity. 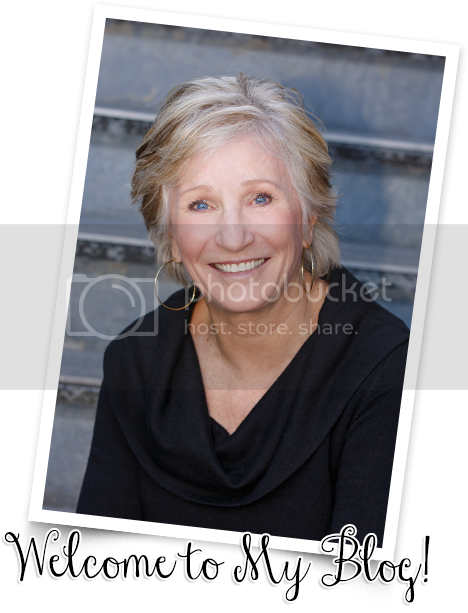 If you're ready to get started say, "I am!" If you're not you're going to miss a lot. 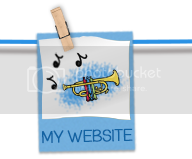 Before starting a lesson, post a checklist of what students will need. As you read down the list, students respond, “Check!” if they are all set. Post the daily schedule and review each morning and after lunch to help children know what to expect. *Draw large T-shirts on poster board. Take photos of students doing daily activities. Write the activity, time, and glue the picture to the T-shirts. Next, hang a clothesline across the top of one of your bulletin boards. Clothespin the T-shirts in order to the line. 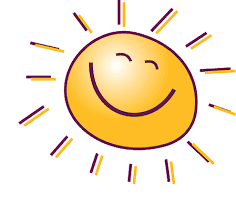 As you move through the day, turn over each shirt so the students can see their day get shorter and shorter. When you get to the last T-shirt do an “end of the day” dance!!! Each student will need a spiral notebook for a planning journal. Give them 5-10 minutes each morning to draw illustrations or write plans for the day. Make daily checklists to help students stay on task. Long assignments can be overwhelming, but completing one step at a time is more manageable. 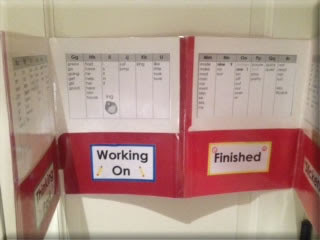 Have children create a folder for unfinished work that they need to "catch up" on. Use a timer to encourage students to finish work and “beat” the timer. 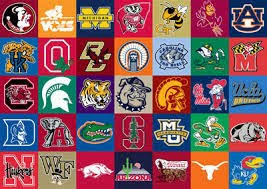 If you are college football fans like we are, this is an exciting time of year. Football gives us a distraction from the world's woes and it gives us something to cheer for and look forward to each weekend. Football can also be a “kick off” for teaching some skills in your classroom. Here’s a simple idea that will save you time and encourage all those little “authors” and “illustrators” in your classroom. 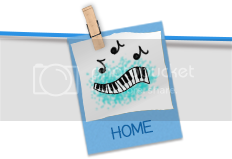 All you need is a file folder to make a display pocket for each child. Cut a 1 ¼” border around the top half of the file folder. Let children decorate it with their name and pictures. Open and laminate. Fold in half and staple to a bulletin board or tape to a wall. Children can display their own work by slipping drawings, stories, etc. in the pocket. Teach this “Writer’s Chant” to get them started. Children repeat each line to this chant as you open your arms wide and clap while stepping from side to side. Who knows the writing process? These mini-offices will help students organize their work space and minimize clutter. They will also encourage students to stay focused. Tape two file folders together for each child. Let them decorate the outside with markers, magazine pictures, trading cards, etc. Staple a copy of the word wall to the inside. When children write in their journals or do independent work, they can stand their “offices” up on their desks. Words they frequently spell will be right there for them if needed. Hint! Search “mini office” to download free printables for your grade level. 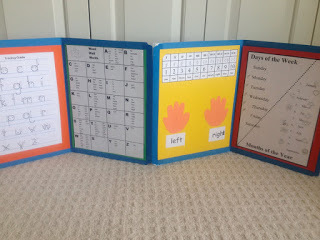 *Make a reading office on one side and a math office with a hundreds chart, math mat, shapes, months, etc. on the other side. *Adapt the offices for the age and skills of your students. For example, you could make an "alphabet office" for the younger children. *Use 2 pocket folders to make a mini-office. Children can insert papers they are working on in the left and work they have finished on the right. *How about this math office with counting beads at the top? BRING AND BRAG - OR SHOW AND SHARE? Yeah, I know that some people think that "show and tell" is a waste of time. In my opinion it's a great way to develop oral language skills and help children become confident in speaking in front of a group. (Above all, most kids love it!) Here are some tips that might make show and tell a more meaningful experience in your classroom this year. Focus show and tell on a specific theme you are studying. Have students bring in something of a particular color, letter, shape, science concept (sign of fall), etc. Limit sharing time to one day a week, or assign several children to each day. You could also have a special “show and share” bag that goes home with one child each day. The person sharing can make three statements about what they have brought. The class then gets to ask them three questions about it. *You could also ask children to come up with three clues about what they have brought from home. (Parents could write these for younger students.) After giving the clues, friends try and guess what it is. Let the class ask 20 questions about show and tell items. Tally their answers on the board. 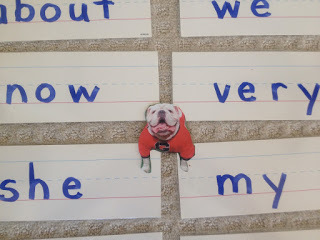 Try “show what you know” where children can demonstrate what they have learned about a theme. They could do an art project, make up a song, do a skit, make a video, etc. Have children close their eyes as friends take turns sharing. Can everyone remember one thing at the end of sharing time? Provide a child-size podium (old music stand) for children to stand behind when they speak. Instead of passing objects around the class, designate a special shelf or table in your classroom where students can place their show and tell objects for friends to look at later in the day. WHAT TO DO WHEN CHILDREN DON'T SING??? SHUT YOUR DOOR AND SING LOUD! 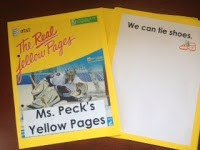 Encourage students to help their classmates with your very own YELLOW PAGES. Give students a red and green plastic cup to keep on their desk. The green cup should be on top unless they need help. 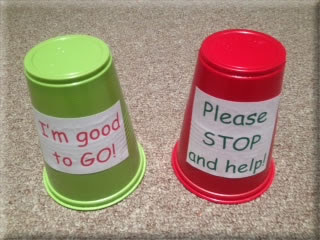 The red cup will indicate to the teacher to “stop” and help. You know there are always a few students who constantly interrupt you when you are having a guided reading group. Put a chair next to your reading table and write "WAITING CHAIR" on it. Explain that if they have a question when your are at the reading table they should ask 2 friends for help. If they still need you they can sit in the "waiting chair" until you finish your lesson. 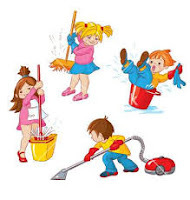 Clean up will be much more successful if you choose a song and sing it consistently when you want the children to tidy up. You really can use any song that you like (country, broadway, college fight song), but use the same song every day and model what you want the children to do. A picker up I’ll be. Hint! Change the words to whatever you want the children to do, such as “pick up the trash,” “push in the chairs,” etc. I can clean quietly, how about you? How about you, my darlin? *Change the words to “push in my chair,” “pick up trash,” etc. Assign classroom jobs weekly. Title the jobs by real careers. LINE UP - LINE UP! Kids and lines don't go together very well, but it's a necessary part of classroom life. Instead of "keep your hands to yourself," try one of these positive approaches. I’m looking straight ahead of me. My arms are at my side. Hint! Write the chant on a poster and tape it to the door. Hi ho, hi ho, it’s off to (lunch, play, home, etc.) we go. Teacher says "Hips" - children put one hand on their hips. Teacher says "Lips" - children put index finger from the other hand on their lips. “Zip” – pretend to zip your lips. “Flip” – fold arms across your chest. Museum Hands – Children clasp their hands behind their backs. Butterfly Wings or Angel Wings - Children put their hands behind their backs and stick out their elbows and flap them like wings. have a turn being first as well as last. Tell me the number on your house. What’s the number of your telephone? A E I O You may be dismissed. While children are waiting and standing in line in the hall encourage them to do push ups against the wall. Here are some ideas that may help your students work out their own problems. 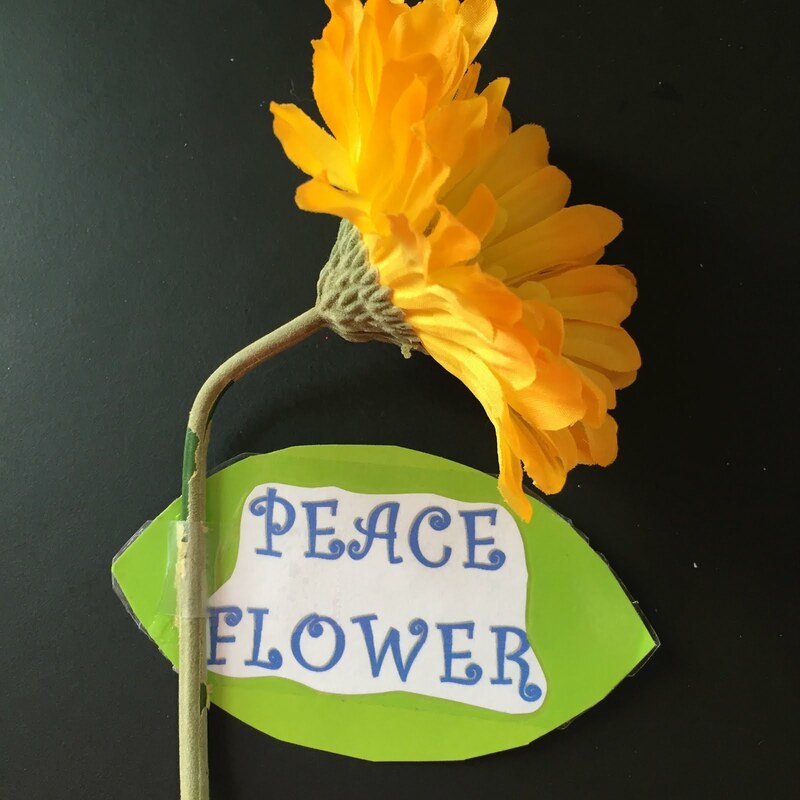 You’ll need a large fake flower to make “peace.” When two children come to you to solve an argument hand them the flower. Explain that they must both hold the flower with two hands and look at each other. When they’ve worked out their problem and have “peace” they can hug and go back and play. Here's another “peaceful” way to solve problems using a composition book or spiral notebook. Ask the children who have had a conflict to sit next to each other at a table. Open the notebook and put it between them. Explain that you want to know both of their opinions of what the problem is. Give them pencils and ask them to write and draw their version of what happened in the book. When they have resolved their problem they can bring you the book and go back and play. Here's an attention grabber that never fails. Tell children when you make the peace symbol (middle and index finger up in the air) with one hand and put the index finger from your other hand on your lips they should do the same thing. Tadaa! Peace and quiet!!!! "Positive redirection" is the best solution to many common classroom problems. Today I've got some ideas that might work for children who constantly interrupt during a read aloud or when others are talking. I'd start by having a class discussion about how to be a polite listener. Remind children that it hurts people's feelings when you interrupt when they are talking. Sign language for "me too" is a way that children can show they've had a similar experience. Demonstrate how to stick out your thumb and pinky as you bend down your other three fingers. Touch the thumb back and forth to your chest to show "me, too"! Show students the symbol for join/connect in sign language. (Hook two index fingers together.) Students put one hand on their head for what’s in their head and then they hold out the other hand for what’s in the book. Join the fingers together to connect what’s in their head and what’s in the book to make a schema. Encourage them to show you that they are listening and connecting to the book as you read with this sign. Explain that if they have something to say during a story they can write it down or draw a picture so you can talk about it when the story is over. Tell children if they want your attention when you are talking to another adult or if you are busy they can hold your hand. You can let them know that you are aware of them and will help them as soon as you can by placing your other hand on top. Check out some of these ideas that teachers have shared with me. And, never ever forget to have a sense of humor! Press #1 for the teacher. Press #2 for your parents. Press #3 for the principal. Press #4 for the President…etc. Place a small mirror on your wall and when the children start to tattle say, "Why don't you go tell that little boy/little girl in the mirror?" *You can also let them tell a plant or other inanimate object. 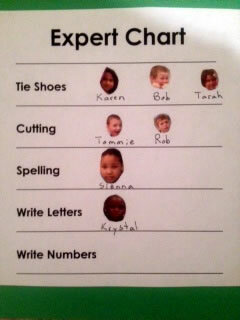 It’s good for differentiated instruction and for children who are non-English speakers. It’s free and it’s simple. Here are some great signs for classroom management to start your school year. I’d explain to the class that you are going to teach them a new language called “sign language.” It’s a special language for people who can’t hear because you talk with your hands. I’d suggest introducing one new sign each day. Encourage the children to model what you do when you make the sign. In a few weeks, you’ll be amazed at how the volume in your classroom has been turned down. I have so much fun learning new ideas from teachers all over the country. I bet you'll find an idea or two just right for your class today. Poke holes through a swim noodle (6”-12” long) and thread ribbon through it. Knot the ribbon and use for movement activities. *Tie ribbons to diving rings and use for movement activities. Use puppets to sing the song "I Had a Bird." Write letters, numbers, colors, shapes, words, or whatever skill you want to reinforce on a big piece of paper. 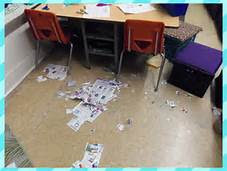 Give children small fly swatters and as you call out information they can "swat" it. Here are some new verses for "The Banana Dance." This call and response reminds students to have a positive attitude, it’s O.K. to make mistakes, and they are all special. I win or I learn. Children love using mirrors in the classroom. Cover a mirror and ask students to look under it to see your favorite kid. *If a student is upset, sad, or misbehaving then ask them to go find the happy well-behaved student that you know in the mirror. When they see themselves they will smile, and it usually changes their attitude. "PAT ON THE BACK" FOR PAT! PLAY IS NOT A WASTE OF TIME!! !